Patterns (made up of tiles) and crystals (made up of atoms or molecules) are typically periodic and have related symmetries. Non-periodic tiling, which creates never-repeating patterns, has only been known to exist in crystals for a couple of decades. Remember the graph paper you used at school, the kind that’s covered with tiny squares? It’s the perfect illustration of what mathematicians call a “periodic tiling of space”, with shapes covering an entire area with no overlap or gap. If we moved the whole pattern by the length of a tile (translated it) or rotated it by 90 degrees, we will get the same pattern. That’s because in this case, the whole tiling has the same symmetry as a single tile. But imagine tiling a bathroom with pentagons instead of squares – it’s impossible, because the pentagons won’t fit together without leaving gaps or overlapping one another. Patterns (made up of tiles) and crystals (made up of atoms or molecules) are typically periodic like a sheet of graph paper and have related symmetries. Among all possible arrangements, these regular arrangements are preferred in nature because they are associated with the least amount of energy required to assemble them. In fact we’ve only known that non-periodic tiling, which creates never-repeating patterns, can exist in crystals for a couple of decades. Now my colleagues and I have made a model that can help understand how this is expressed. In the 1970s, physicist Roger Penrose discovered that it was possible to make a pattern from two different shapes with the angles and sides of a pentagon. This looks the same when rotated through 72-degree angles, meaning that if you turn it 360 degrees full circle, it looks the same from five different angles. 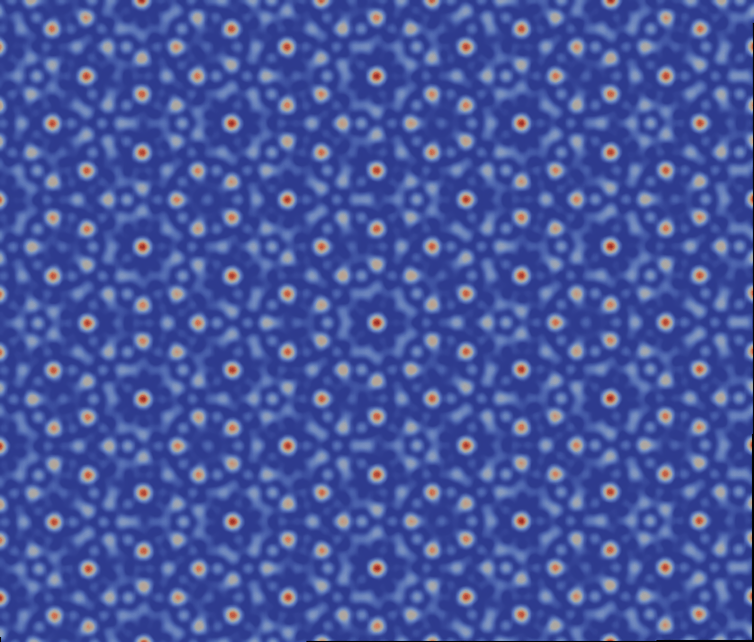 We see that many small patches of patterns are repeated many times in this pattern. For example in the graphic below, the five-pointed orange star is repeated over and over again. But in each case these stars are surrounded by different shapes, which implies that the whole pattern never repeats in any direction. Therefore this graphic is an example of a pattern that has rotational symmetry but no translational symmetry. Things get more complicated in three dimensions. In the 1980s, Dan Schechtman observed an “aluminium-manganese” alloy with a non-periodic pattern in all directions that still had rotational symmetry when rotated by the same 72-degree angle. Until then, crystals that had no translational symmetry but possessed rotational symmetry were in fact inconceivable – and many scientists did not believe this result. In fact, this was one of those rare occasions when the definition of “what is a crystal” had to be altered because of a new discovery. In accordance, these crystals are now called “quasicrystals”. The never-repeating pattern of a quasicrystal arises from the irrational number at the heart of its construction. 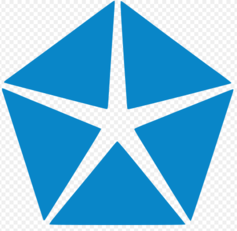 In a regular pentagon, the ratio of the side length of the five-pointed star you can inscribe on the inside of a pentagon, to the side of the actual pentagon is the famous irrational number “phi” (not to be confused with pi), which is about 1.618. This number is also known as the golden ratio (and it also satisfies the relation phi = 1+1/phi). Consequently, when a quasicrystal is constructed with tiles that are derived from a pentagon – like the ones Penrose used – we observe rotational symmetry at 72-degree angles. We see this five-fold symmetry both in the image of the quasicrystal as the ten radial lines around the central red dot (above), and also in the scale model of the central part of the quasicrystal made with Zometool (below). In the model, it helps to think of the white balls to be the locations where we would find the particles/atoms of the crystal structure and the red and yellow rods to indicate bonds between particles, that represent the shapes and symmetries of the structure. In our recent publication, we identified the two traits that a system must have in order to form a 3D quasicrystal. The first is that patterns at two different sizes (length-scale) which are at an appropriate irrational ratio (like phi) both occur in the system. And second that these can influence each other strongly. In addition to the never-repeating quasicrystal patterns, this model can also form other observed regular crystal structures such as hexagons, body-centered cubes and so on. 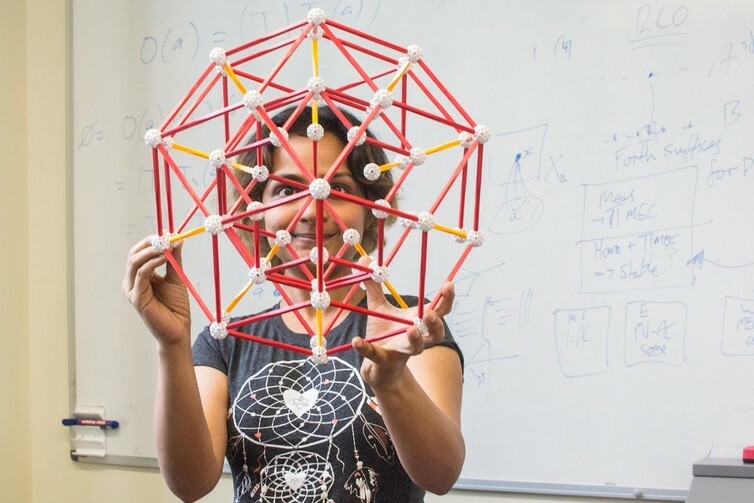 Such a model makes it possible to explore the competition between all these different patterns and to identify the conditions under which quasicrystals will be formed in nature. The mathematics behind how such never-repeating patterns are created is very useful in understanding how they are formed and even in designing them with specific properties. That is why we at the University of Leeds, along with colleagues at other institutions, are fascinated with research into such questions. However, this research isn’t just a conceptual mathematical idea (although the mathematics behind it is addictive) – it has great promise for many practical applications, including making very efficient quasicrystal lasers. This is because, when periodic crystal patterns are used in a laser, a low-power laser beam is created by the symmetry of the repeating pattern. Having defects in the crystal pattern or alternatively using a never-repeating quasicrystal pattern at the output end of a laser, makes it possible to create an efficient laser beam with high peak output power. In other applications, some researchers are even considering the reflective finishes that quasicrystals might create if added to household paint. Think Donald Trump is too hotheaded to be president? New research from Yale suggests Trump's lack of careful consideration may help him build trust with voters, while Clinton's carefulness harms her.